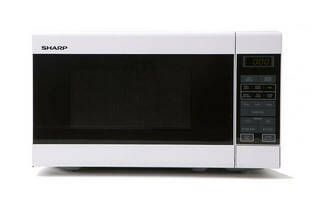 Snapshot: The Sharp R210DW is an 18L standard microwave with auto-cook. How well does it defrost mince and chicken? Small usable volume. Small viewing window on door. Small turntable (only fits small round dishes or plates). Does not beep or prompt you to turn food during express defrost function.